Old farm restored in old style but with modern comfort. Modern kitchens , comfortable living room with sofa bed and TV. Central heating. Garden with table, chairs, lounge chairs. Nestled in the countryside of our small farm with vineyard, olive grove and some fruit trees. And 'possible to see some farm work such as the grape or olive harvest and the various stages. This apartment was perfect for our stay; two couples. The en-suite bath with each bedroom was great. The apartment was exactly as it was presented. The location is very central in the Tuscany area. Rossanno was a perfect host; he left us a bottle of his wine and some of his olive oil to try. We would definitely recommend this location to stay. We hope to make it back someday! Beautiful and peaceful, great location. I would highly recommend! If you want the feel of Tuscany, you have it in this quaint apartment. Needs a little updating when it comes to the linens but otherwise very comfortable. All the dirt roads surrounding the vineyards are a wonderful retrieve to walk with a glass of wine. We were a little surprised that the only way to access it was thru a dirt road, which is not unusual for the Tuscany area. The Family that owns it is very welcoming making it a nice place to stay. We had a lovely stay at this apartment. It is located right on the family farm right outside San Quirico. It was so peaceful and relaxing. The apartment is well appointed and comfortable. Rossano was so kind and helpful, and gave us good tips and recommendations. A bottle of their own wine provided was very nice too. Overall, we really enjoyed our stay and highly recommend this property. The apartment was in a beautiful setting, with a vineyard and Rossano greeted us with a glass of wine and an introduction to his property. It was comfortable and the town of San Quirico d' Orcia was interesting and quaint. Rossano also helped us find a wine tasting at a nearby vineyard in Montelcino called Il Cocco. It is family run and is amazing. A great spot and we had lunch there too. Again loved the apartment would recommend to friends. Beautiful farmhouse, nice location. Very accomodating. Hard to find, but we stopped at a local shop. The locals, even though we didnt speak Italian, found our family, called them and Rosario came and retrieved us. At the heart of the charming park of the Val d'Orcia. 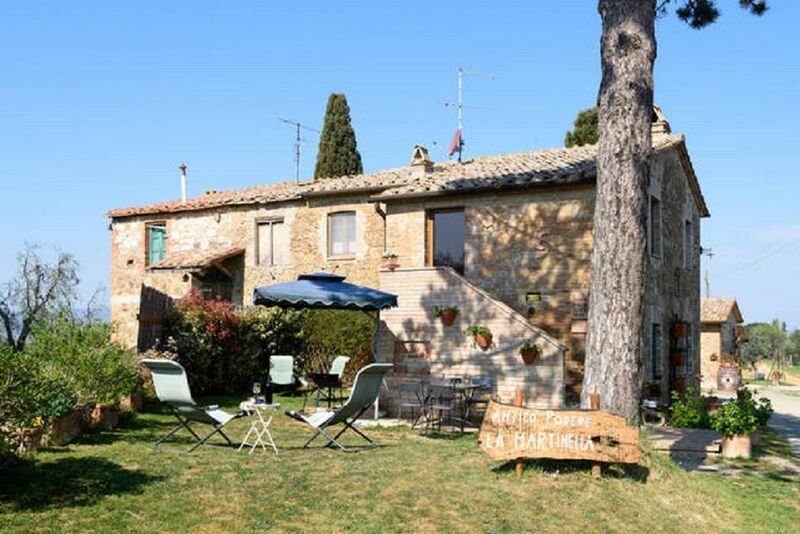 In the area of Chianti Colli Senesi near to Montalcino Pienza, Montepulciano and the beautiful village of Bagno Vignoni with its ancient Etruscan bath in the center of the square. Production area of fine wines and oils with many restaurants serving typical Tuscan dishes. Excellent base for visiting all the Tuscan cities: Florence, Siena, etc.. .